This card is entered into this week's Crazy Crafters Project Highlights. Click here to see all the great cards and vote for your favourites! At this time of year, I'm kept busy making cards for my wonderful husband since our Anniversary is in February as well as Valentine's Day! Just the other day I was trying to explain to him just how much he means to me and how grateful I am - every minute of every day - that we met and that he chose to marry me. I thanked (and should do so much more often) for rescuing me from the life I would have had without him. 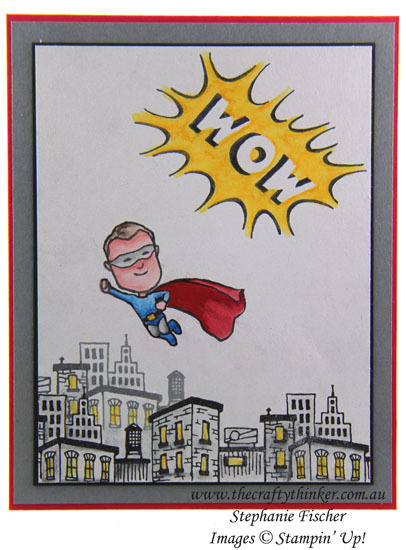 So, since my husband really is my Everyday Hero, I really had to use this stamp set for him! The layers are Real Red, Basic Gray, Basic Black and Smoky Slate and I stamped directly onto the Smoky Slate layer, starting with the buildings which I stamped in Basic Black and then masked. I then stamped some more buildings using Basic Gray ink to set them back a bit. Everything else is stamped in Basic black and coloured with watercolour pencils and an aqua painter with the exception of the cape. Since I wanted the cape to have enough strength of colour to pick up the Real Red card, I added some ink with a Stampin' Write Marker and Blender Pen. 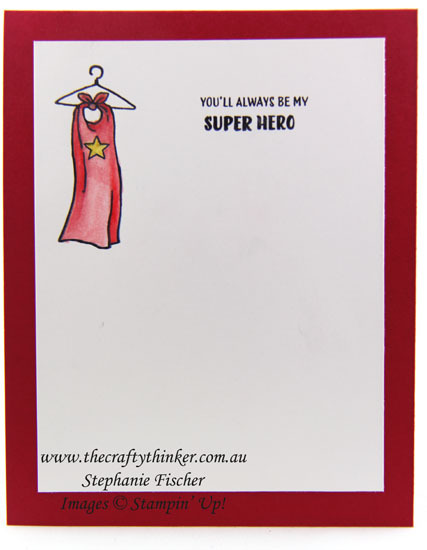 I haven't yet decided whether this card will be for Valentine's Day or our Anniversary but inside I will let him know how grateful I am that he chooses to hang his cape in our wardrobe!